Give your burgers some Asian flair by mixing ginger, Thai chili sauce, garlic, cilantro, green onions, soy sauce and lime into your lean ground beef before shaping the burger patties. 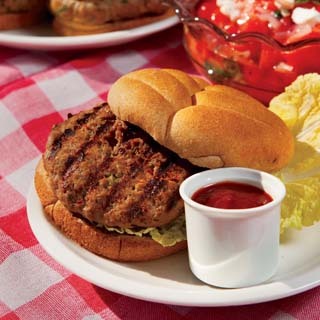 Nutrition Highlights: Keep burgers heart-healthy and choose ground beef that’s at least 90 percent lean. Check labels for the lean (90 percent) to fat (10 percent) ratio. 93/7 ground beef is even leaner. Preheat grill to medium. In a large bowl, combine ground beef, bread crumbs, egg, green onion, garlic, cilantro, ginger root, Thai chili sauces, soy sauce and lime juice and zest. Mix well. Lightly shape into 5 half-inch-thick patties. Place burgers directly on greased grill grates and cook until instant read thermometer registers 160 degrees, about 7 to 8 minutes. Turn burgers once while grilling. Serve each burger with two Napa cabbage leaves and bun. Condiments aren’t really necessary with these flavorful, moist burgers. 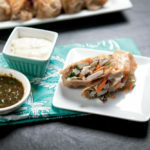 But just in case you want extra flavor, skip traditional ketchup and mustard and serve Thai hot and sweet chili sauces. Linked up at Sugar and Spice and What’s Cooking Wednesday.